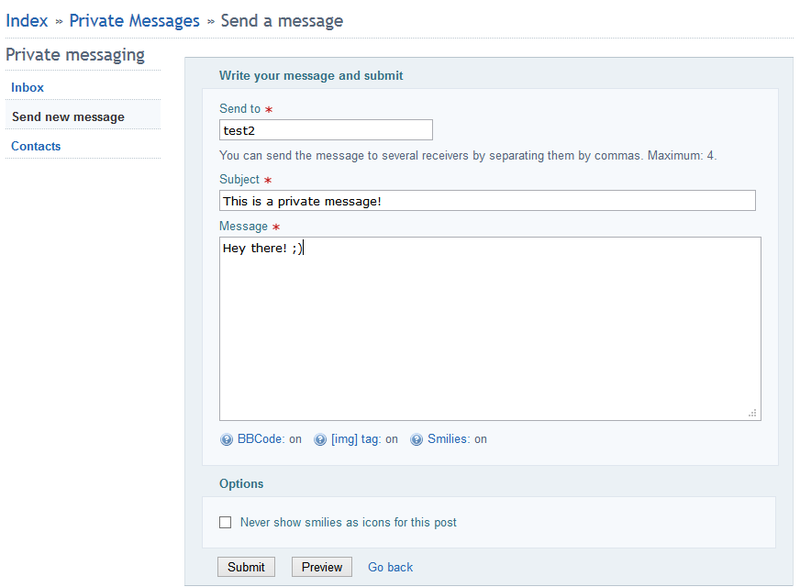 Adds functions for sending messages to people within FluxBB. There were I recall some XSS bugs in 1.2 versions of this mod. French users use this mod since 2006, and for what I know, there is no XSS exploits in this version. I installed this mod. but I had to do some minor modifications to it. To work with 1.4? Could you post what you had to do exactly? The translations needed some updating too. I have a diff to git. I can send it to you but it contains other modifications too. Hey, does this mod have the ability to put new / unread messages in bold for example? (or have a different icon in front of unread messages) - I'm using the simple "private message' mod now and this feature is missing and i'd like to change it for something better..
How is this one different? @hussam : fixed, thanks. I'd like to see the others modifications, if it's not a pb for you! Will a diff to git work as well? I have other mods installed too and I can't tell anymore which change belongs to which mod. Where do I send it? I need this mod, but where is it ? Well, no pb, do not bother you to search the modifications, I think they are all fixed . Under review, again and again . And I have to update the modifications for profile.php, because of FluxBB 1.4.1 . If I have the old revision installed, do I need to revert it and install the new one when it's reviewed? The mod is now accepted; to update your version, just replace all your old files by the new one, and change the caracters in the database from ISO-8859-1 (iso swedish...) to UTF-8 (utf8_general_ci ...) . change the caracters in the database from ISO-8859-1 (iso swedish...) to UTF-8 (utf8_general_ci ...) . 2. pms_send.php line 374 and 376 - no close tag for "label"
You're right, that's a security hole. Edit: the exploit is harder to fix than I thought. If you know how to fix it... please tell me ! I'm going to fix it asap! @daris : I'm taking notes to fix these bugs. Thanks! It's actually not hard at all. When you have the results as an array, you use array_map with intval as the callback function. Then you can implode without fear. I just uploaded the update. Please, accept it quickly =/. Thanks to Visman, daris, and Smartys btw!